Jarana 1: Marinera; Tri-la-la, tri-la-la. la-la-fa, pabnero sube a la pidma - Marinera; Golpe. guitarra y cajon - Mamma: permfta San Cantimno - Resbalosa & Fuga; Eso de ser inocente. Guaclii Paiuvian. Jaiana 2: Marinera; Sl a torias la llaman china - Marinera; Ponnfta San Canturfno - Marinera; Aperendan flores de mi - Resbolosa & Fuga; Murlo mi fey. En Lima matan los perros. Jarana 3: Mannera: Mweno pintan a Crisio - Marinera; Aprendm flores de mi - Marinera; Desde la esqulna del Carmen - Resbalosa & Fuga; Al riespertar vi quo era un sueno. Intoned fuga. Jarana 5: Marinera; A fuego mandar locar - Marinera: Golpe. guitarra y cajon - Marinera: Soy el toro lay chumbirazo! - Resbalosa A Fuga; Las mujeres de Uma. Una jarana asi. Jarana 6: Marinera; Soy la campana de oro - Marinera; Por las trenzas de tu pelo - Marinera: Manda el amor como un rey - Resbalosa & Fuga; Rompe la IKerata. - Chancaquila 'e cpncha. Jarana 7: Marinera: Por ser dia - Marinera: Zamblla, pelito de wo - Marinera: Manda el amor conw un rey - Resbalosa & Fuga; Rompe a la; Chawaqulla 'e cancha. The jarana is an example of an improvised vocal duel. It was performed in the back streets of Lima, Peru, and can be interpreted as a precursor to similar urban musical 'cutting-contests' associated with stride pianists in Harlem in the 1920s and rappers in and around ghettos across the world. Known locally as “los cuatro ases de la jarana” (The Four Aces), and renowned as the finest practitioners of the dexterous craft, Manuel Quintana Olivares, Augusto Ascuez Villanueva, Alias Ascuez Villanueva and Luciano Huambachano Temoche - who lived among the urban poor and mainly black slums and ghettos of Lima - developed a virtuosic ability to use rhyme to compete for social recognition and ascendancy within a squalid and at times desperate urban milieu. 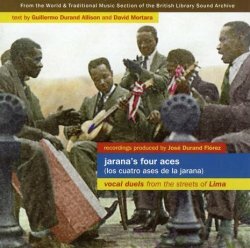 Jarana's Four Aces is a collection of previously un-released field recordings made in the 1950s by Latin American literary historian José Durand Flórez (1925-1990) and has been restored and archived by British Library Sound Archive under the auspices of Dr Janet Topp Fargion as part of the BL's World and Traditional Music Section. The extensive notes, contained in the accompanying 20-page booklet and offering historical development, musical analysis, and rare photos provided by Guillermo Durand Allison from the National Cultural Institute in Lima and David Mortara from Kings College, University of London, are insightful and informative in outlining the form and structure of a jarana in addition to its performance practice. For instance, we learn that each jarana follows a series of clearly defined movements sung exclusively in either a major or minor mode; and that the initial melody is often based on a well-known verse taken from classical Spanish poetry of colonial times which is often subsequently contrasted with more contemporary Peruvian themes. The 'art' of canto de jarana lies in the ability to fit the lyrics of a particular verse with a given melody. These melodies are often borrowed from popular song or from Spanish operatic themes. Virtuosity is called for when the jaranistas compete with each other by improvising a typically tongue-twisting passage known as the llamada de fuga. The duels, accompanied by some breathtaking triple-time accompaniment of two guitars (the primera guitarra supports and sustains the melodic line while the segundo guitarra plays ostinato figures), cajón peruano (the Peruvian wooden box drum) and palmas (handclaps - an essential element of jarana), are spirited and good-natured; the authors compare them to a 'rally' in a game of tennis and the jaranistas are challenged to prolong the match (desafío) without breaking it down. Many matches, which obviously couldn't fit on this recording, can last up to half-an-hour! The authors of the accompanying booklet remind us that the jarana also functions as a courtship dance whose choreography is dictated by the improvised structure of the singers' performance. Reflecting the music, the dance starts according to fairly strict parameters but frees up progressively becoming more licentious, free and improvised as they reach the final fuga section. Again, virtuosity is highly valued and appears to endow the performer with a type of social distinction or, in the words of sociologist Pierre Bourdieu, 'cultural capital'. Indeed, this aesthetic is often shared in urban improvised traditions from Liszt, Chopin and Hiller in Paris to Ben Webster and Coleman Hawkins in Manhattan, and this CD vastly enriches our understanding of improvised musical traditions in relation to their social contexts. Besides the high-spirited 'authentic' sounds of the street that can be enjoyed by listening to the recording, according to the authors the aesthetic appeal of the jarana tradition derives from the exploitation of musical concepts such as counterpoint (buen contrapunto), ornaments, cross-rhythm, polyrhythm and hemiola, and syncopation used to create rhythmic tension (cantar robando). José Durand Flórez has successfully captured an almost-forgotten musical tradition. Through this stimulating collection, he illustrates the ways in which jarana performances used to inject a unique and uplifting energy into what was, in the beginning of the 20th century, one of the world's most fetid and over-crowded cities. The music emerged as a breathing space at weekend parties. Moreover, this captivating music became a symbol of criollismo, the galvanisation of cultural practices to assert a national identity in face of occupying forces. The jaranista's charm and dexterity made them celebrities and their improvisatory rhymes became appropriated as political propaganda. In common with so many other improvisatory traditions, as the jarana became more and more isolated from its initial cultural contexts, it became more formalised and stylised. Tragically, as a sung competition, it no longer exists. Today, remnants of the jarana phenomenon can be heard accompanying dances but on a stage rather than in the streets. This recording, therefore, succeeds in capturing the essence of a unique but forgotten street sound, an urban folk music that was a precursor to rap, and is thus invaluable in our understanding of the evolution of urban improvised vocal traditions.